Embrace the Tank: Here are five squads that should punt this upcoming season and think long term. Philadelphia validated its half-decade of tanking in 2017-18, riding a pair of former top-three picks to the organization's first 50-win season since 2000-01. Rather than chase relevancy through the free-agent waters, the Sixers trusted the ping pong balls, landing the key franchise chips necessary to build as sustainable winner. And throughout the league, the rewards of high lottery selections are paying off. Boston rode 20-year-old Jayson Tatum to Game 7 of the Eastern Conference finals, and the Lakers were able to lure LeBron in part due to its young core highlighted by Lonzo Ball and Brandon Ingram. Rare is the contender built solely through free agency. In that spirit, the NBA saw an extended tanking effort throughout last season, with a slew of teams racing to the bottom of the standings. In a draft class rife with high-ceiling prospects, many organizations saw their next chance at a superstar coming from a stage at the Barclays center. Phoenix took home the top prize in center DeAndre Ayton, with numerous other top 10 selections standing as potentially franchise-altering acquisitions. The tanking pool projects to be smaller this season. Lottery stalwart Sacramento is without its first rounder – leaving either Boston or Philly another asset in its warchest—and Dallas is gunning for a playoff spot, even in an extremely-crowded West. But eyeing the conference cellar still makes sense for a few teams. So which organizations are primed to tank in 2018-19? Here are our top five candidates. The Hawks are the easiest tanker to spot, even in a weak Eastern Conference. There simply aren’t enough assets to vie for a playoff spot. Atlanta has already signaled its disinterest in competing, dealing Dennis Schroder to Oklahoma City in July. The trio of Kent Bazemore, John Collins and Taurean Prince shows some promise, but those are rotation players at best. Add in the transition from the Big 12 to the NBA for Trae Young, and this will be a rough year for the Hawks. On the bright side for Atlanta, the Hawks could have quite the impressive draft haul in 2019. In addition to its presumed top-five selection, Atlanta could recoup picks from Cleveland and Dallas, two teams projected to finish the season outside the playoff picture. The Hawks will need some luck to receive the selections, though, with the Mavs’ pick protected inside the top five, and the Cavs’ protected inside the top 10. Three lottery selections would be a dream come true for the Hawks, but at the very least, Atlanta will enter the 2019 draft with one top-five pick, possibly at No. 1 overall. Is Giannis Antetokounmpo the Best Player in the East Now That LeBron Is Gone? Next season will mark the first year since 2013 that Brooklyn will be incentivized the lose. The Nets’ nightmare 2013 trade with Boston is now in the rearview window, four first round picks and two franchise alterations later. While the Celtics used their Brooklyn picks to acquire a core of Jaylen Brown, Jayson Tatum and (via trade) Kyrie Irving, the Nets sunk to irrelevance, with Garnett and Pierce quickly meeting father time. The ill-fated deal did give Brooklyn back-to-back playoff appearances, but then a string of three straight 50-plus loss seasons. Despite being armed with its first-round pick for the first time in half a decade, Brooklyn has said it wants to compete in 2018-19. Head coach Kenny Atkinson has discussed his wishes to bring the Nets another eight-win improvement from its 28-win 2017-18 campaign, and Brooklyn acquired Kenneth Faried, Ed Davis and Jared Dudley in the offseason. Tanking doesn’t look to be a popular strategy amongst the Brooklyn brass. But Atkinson and Co.’s comments are more August optimism than regular-season reality. Much like Atlanta, Brooklyn does have a nice young core – buy as much Jarrett Allen stock as you can heading into next season – but nothing near the firepower to reach the .500 mark. When the doldrums of winter hit the Barclays Center, a top pick should present itself as a more enticing option than 36 wins and a No. 10 seed. Atkinson has instilled a strong culture in Brooklyn despite the back-to-back seasons under 30 victories. Another year of losing plus a top-flight pick won’t erode that. Brooklyn has its sights set on the summer of 2019, sporting cap space for two max contracts. The difference between 25 and 35 victories won’t sway many free agents in their decision to join the Nets. But a top-five pick either as a draft selection or trade chip could make Brooklyn a more enticing situation for the next class of free agents. Adding the No. 1 pick DeAndre Ayton won’t do enough to bring Phoenix out of its losing ways in 2018-19, nor will the addition of Trevor Ariza. The Suns are all-but-guaranteed to finish near the bottom of a stacked West, with little incentive to alter its course heading into next season. 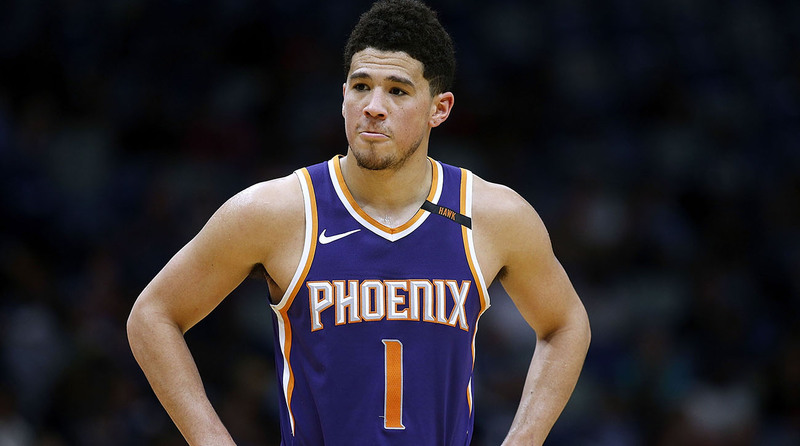 Devin Booker already inked his extension, sticking with the Suns through the 2024 season. Now, Phoenix should be focused on building its young core around Booker, Ayton and two-way force Josh Jackson. First-round pick Mikal Bridges will also get plenty of playing time, and should be more polished than many other rookies after three years at Villanova. The 2018-19 season should also bring an added year of examination of the Suns’ other youngsters. Phoenix needs to find out what they have in Dragan Bender and Marquese Chriss, both free agents in 2020. Bender has shown promise as a mobile pick-and-pop threat, while Chriss’ tenure has largely been a disaster. Still, for a team nowhere near playoff contention, what’s added playing time for Chriss other than a headache for new head coach Igor Kokoskov? Phoenix will trot out seven contributors 22-years-old or younger next season, a recipe for 50-plus losses. But as Philadelphia has shown, the process can be more impactful than the results. Phoenix’s best scenario in 2018-19 is a lot of losing, paired with the development of Booker, Ayton and the rest. Add in another top-five pick in 2019, and Phoenix will make Philly’s draft haul look tiny. LeBron’s departure to Los Angeles should have hastened the next teardown in Cleveland, a redux of the 2010-11 tank job that netted Kyrie Irving. Instead, owner Dan Gilbert remained stubborn in the face of the obvious, giving Kevin Love a four-year extension that will last until the five-time All-Star turns 34. With Love’s extension in hand, Cleveland will fight for a playoff spot in 2018-19, but that projects to be an uphill climb, even in a weak Eastern Conference. The Cavs’ roster entering opening day is a mishmash of overpaid vets and unproven youngsters, with no All-Star talent outside of Love. Banking on big contributions from J.R. Smith and Tristan Thompson without James seems like a fool's errand, and the guard duo of George Hill and Jordan Clarkson doesn’t inspire much confidence. The Cavs’ best hope is for Collin Sexton to have a Donovan Mitchell-esque rookie season, but that’s asking a lot of a kid making the leap from the SEC to the NBA. The pieces for a contender aren’t in place. Gilbert’s wishes for a quality product read as primarily a business decision. After years of paying considerable luxury tax money, Gilbert won’t want to see his attendance and revenue plummet. But are fans going to fork up cash to see the Hill-Love pick-and-pop? Probably not. Without James as the marquee, The Cavaliers are one of the league’s last attractive entities, devoid of star power and entertainment value. Reality will set in sooner than later. Cleveland’s best path back to the top of the conference is to replicate its losing ways from 2011-14, a period in which the Cavs netted three No. 1 selections. With James and Irving, the Cavs have found success in the 2000’s through homegrown talent. They should take that road again, rather than chase the ghost of LeBron’s past. Roundtable: Is Carmelo Anthony a Lock for the Hall of Fame? New York’s fate in 2018-19 rests on the legs of Kristaps Porzingis. The young Latvian is still recovering from a torn ACL suffered in February, with a timetable for his return still yet to be set. If Porzingis is ready for a return before Christmas, there’s a chance for New York to tread water and remain in the playoff hunt prior to his return. But if the rehab lasts until February or even March, the Knicks could very well play themselves out of contention before Porzingis’ presumed return. If New York struggles out of the gate, keep an eye on Enes Kanter and his expiring contract as a potential trade chip. Courtney Lee is signed through 2020, but at $12 million, he could be an appealing asset to a team needing wing depth. Besides, the Knicks’ eyes are on 2019, with Irving, Kevin Durant and Jimmy Butler set to hit free agency. A bundle of cap space and a top-five pick is the best route toward a New York revival, not a rushed Porzingis return and outside chance at a first-round exit.